There are unlimited ways to prepare an egg, but it's good to start by mastering the basics and build on those key recipes. Once you have an excellent base for an omelette or scrambled eggs, it's easy to add any add-ins to make it that much better. What are your favorite easy breakfast recipes that utilize eggs? Here are some recipes you can do through the year. ~ Preheat oven to 375F. Spray a Non-Stick 12-Cup Regular Muffin Pan with cooking spray. Spray the base of the cavities and sides, then run your finger over the sides so that every inch is liberally coated with spray or you will be chiseling off stuck food; set pan aside. ~ In a large bowl add carrots, peppers, peas, corn (or mix and match with your favorite vegetables) and toss to combine. ~ Loosely pile about 3 tablespoons of vegetable mixture to each muffin cavity, or enough so that each is filled to about 2/3 to 3/4 full; equally distribute filling mixture among cavities until gone; set pan aside. ~ In a 2-cup glass measuring cup (the measuring cup makes for easy pouring), crack the eggs and lightly beat with a whisk. ~ Add the salt and pepper, to taste, and whisk to combine. ~ Pour about 2-3 tablespoons of egg into each cavity, equally distributing among the cavities. They will be about 3/4 full after being topped off with egg. 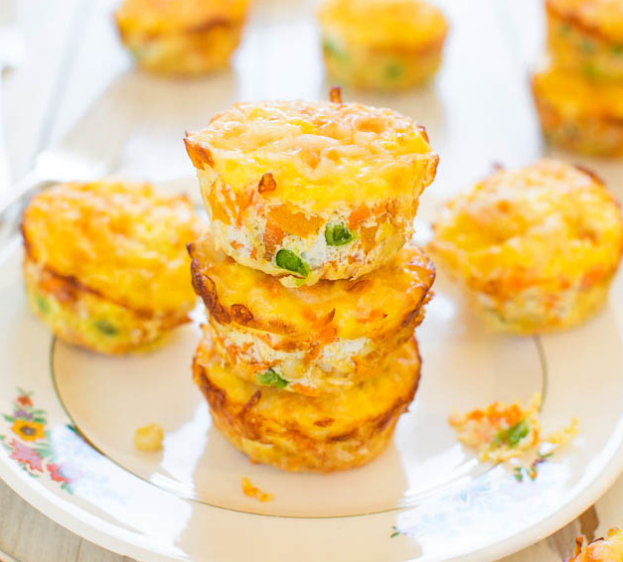 ~ Top each cup with a generous pinch of cheese, about 1 tablespoon each. ~ Bake for about 18 to 20 minutes, or until muffins are set, cooked through, and are lightly golden. They will puff in the oven, but sink upon cooling. Allow muffins to cool in pan on top of a wire rack for about 10 minutes before removing. ~ You will likely need to rim each cavity with a small knife to help dislodge muffins. I find it easiest to rim with a knife and then 'pop' the muffin out using a small spoon. ~ Place tomatoes on a baking sheet. You might need to slice a tiny bit off the bottom of each tomato to keep them level on the pan. 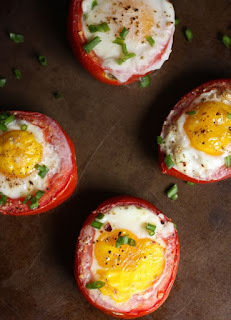 ~ Crack eggs and gently place in the cavity of each tomato. ~ Season with salt and pepper. ~ Bake for 6-7 minutes if you like your eggs runny. 8-10 for soft set. ~ Remove from oven and top with fresh chopped herbs. ~ Serve as is or on top of a crusty piece of toasted bread. ~ Preheat the oven to 350F degrees. In a medium skillet, brown the turkey sausage links on medium-high heat. ~ Cook until sausage is brown all the way through. Cut sausage into 1/2 inch pieces. Set aside. ~ In a large mixing bowl, whisk together egg whites and eggs. Whisk in skim milk and season with salt and pepper, to taste. Stir in the chopped spinach.